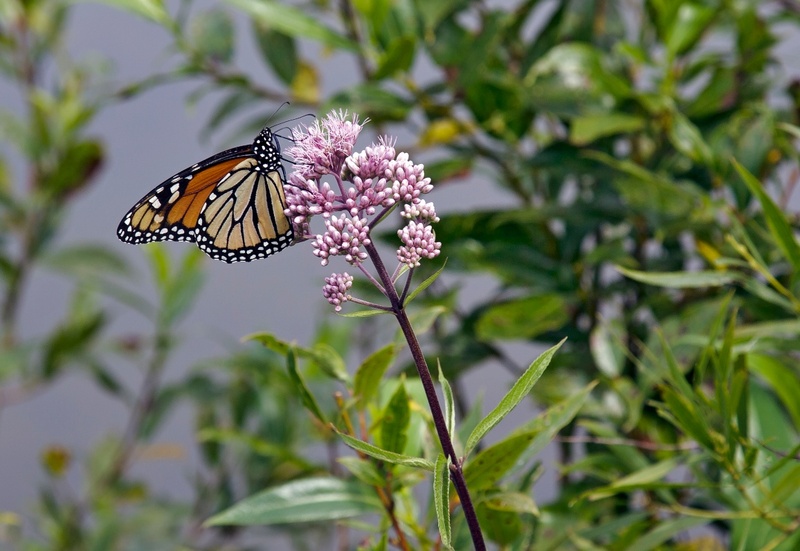 Babs Young writes: Here’s a Monarch butterfly but I have no idea the identity of the plant. Well now. I happen to know some people who love a challenge. But before we put you to work, you get to see the photo. It’s only fair. You can click on the image for a really big version. Then you can consult your favorite wildflower guides in an effort to figure out what the plant is. I will give you a head start. It is not a commoner. Have fun. OK – I’ll give it a shot. Is it Joe Pye Weed? I couldn’t figure out the “not a commoner” bit, but then I think I did – but I’ll sit on that in case you want to provide the details! I do believe that Joe-Pye weed is correct. Several have written me. It has the leaf of a swamp milkweed, but that’s not it either! I have a Monarch Guide published by the Canadian Nature Federation which lists the adult monarch’s favorite blooms. The guide’s photo of the swamp milkweed is a deeper pink than the one in Babs’ photo but the description mentions that the clusters are ‘flesh-colored.’ You know how Nature loves variety. I’ll tell you what it is – pretty. My botanical knowledge rarely extends beyond “weed” or “flower” or “edible”. But I’m happy in my ignorance, and will gladly stay there. OK. I have to go with some type of Joe Pye, too. It was my first thought and Monarchs love them, but the leaves, the head- not typical. Those are awfully slim leaves. Since you said it’s not “a commoner” that means it’s a hybrid. So I rest my case. It’s a Joe Pye. Actually . . . all I really meant was that it was not the Common Milkweed, which is the first thing everyone thinks of when they see Monarchs. I was comforted by “not typical.” That surely means that it’s OK to call it Joe-Pye weed. Or perhaps Eupatorium atypicum. Here you go – the information I found that makes this “not a commoner”! You can find the whole article here. The genus Eupatorium… honors Mithradates VI Eupator, king of Pontus (an ancient country in northern Anatolia in Asia Minor), who died in 63 b.c. The king is remembered among botanists and toxicologists for having been “one of the first to study intensively the art of poisoning and the preparation of antidotes.” He is said to have immunized himself against poison by taking increasingly large, nonlethal doses. One plant he experimented with is supposed to have been a member of the genus. About five species of North American eupatoriums are known as Joe-Pye weeds. The origin of the common name is uncertain. The most prevalent theory holds that it refers to a Colonial-era Native American named Joe Pye, who is said to have used one of the species to cure typhus. Another is that Joe Pye was a nineteenth-century white “Indian theme promoter” who used the root of one of the species to induce sweating in cases of typhus. The earliest use of this name dates to 1810–1820. As always, readers astonish me with riches. One of the things I found by following shoreacres’s link was this: “They hybridize widely in nature, making identification a challenge even for botanists.” That is a great comfort, for as we all know, I am no botanist. ‘Course. Lessee . . . kisses from the Cowboy? A spin-dance on the beach with Miss Sadie! Complimentary tickets to the opening of “Ladies of the Lakes” at the Elk Rapids Area Historical Museum–all about the women lighthouse keepers of the Great Lakes. Thanks, Eldon. I hope you were able to get over to the Wilkinson.